Looking for the best Super Bowl Party Games to entertain your guests this year for the big game? It will be a land slide, when you win the crowd over with these amazing Printable Super Bowl Games from our friends at Python Printable Games! 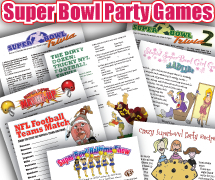 They have created this fun Super Bowl Home Party Games Printables Pack! There’s 15 printable games and activities, suitable for all party goers .. Even the girls! The pack includes Super Bowl Trivia, History of Super Bowl Match-Up, Super Bowl Halftime Show Trivia, Top Super Bowl Ads Trivia, NFL Dirty Dozen trivia, NFL Teams word search, NFL Home Cities match, Super Bowl Widows Newlywed Game for girls, Crazy Super Bowl Recipes Game for girls, Super Stupid Bowl Mad Libs for girls, Super 'Bowl' Toilet Trivia Game for girls, Hot And Spicy Food Trivia, Beers Of The World and much, much more fun Superbowl party games! You might expect to pay a hefty price for 15 printable games, but here's the best news of all. This pack costs only $19.95. There's nothing else to pay: no shipping or handling (it's emailed to you), print as many copies as you like, there's no extras or hidden costs. Just pure Super Bowl Party entertainment! These games are perfect before the game, during half-time, or even after the game is done and party is still going!. Don’t’ worry girls, even if you HATE the football, we’ve saved the best game just for you! 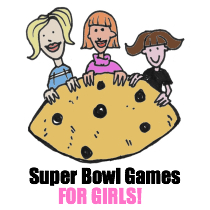 Get Your Super Bowl Party Games Pack! Here!